We have been providing our customers with quality rock ‘n roll memorabilia including rock t-shirts, posters, hats, caps, stickers and patches, for close to 30 years. Rock America started out selling rock merchandise at festivals, county fairs and concert venues all across the country, eventually opening our retail locations in the northern Chicago suburbs. Though band tees and accessories are our bread and butter, we also carry an assortment of merchandise featuring your favorite pop culture icons. 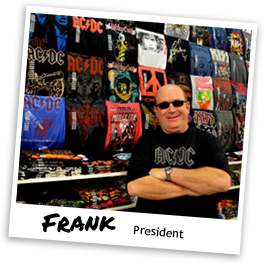 Our goal is to provide our customers with merchandise from all spectrums of the rock music genre. We carry merchandise from classic rock to heavy metal; alternative to punk. We pride ourselves on carrying items that people want—not just the latest trends, but also the tried and true classics. The Rock America crew eats, sleeps, and breathes (and listens to!) rock ‘n roll; we’re always looking for the next big thing to rock our world. We’re very proud to be an independent, family owned business. Our roots have given us a particularly close relationship to our customers, and have allowed us to stay in touch with what they crave. Our knowledge, selection, dedication to our customers, and our longevity are what set us apart from every other website selling a rock band t-shirt. We’re always happy to help, and we love building lasting relationships with our customers—many of which have been coming to our stores and placing online orders for years. This is our passion, and we’re thrilled to be sharing it with you.